Mourning doves, photographed at Tivoli Sand Pines Preserve, Deerfield Beach, Broward County, in April 2014. 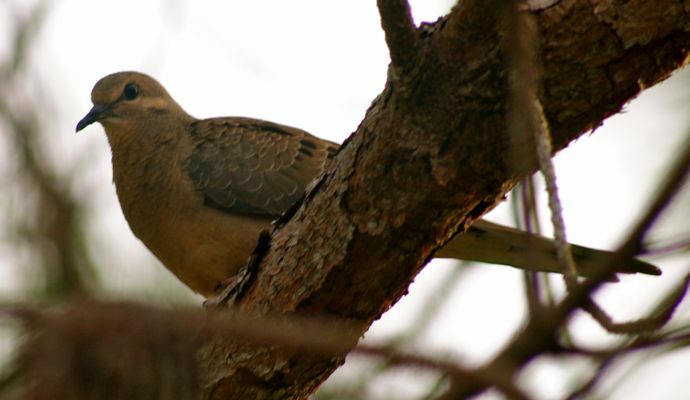 The mourning dove, Zenaida macroura, is the most hunted species of bird in North America — hunters bag 20 million of them every year, according to Cornell Labs. No wonder they make that doleful call! On the other hand, there are a lot of them — it's estimated that the North American mourning dove population is somewhere near 350 million. This is a bird that you more than likely will hear before you see it. It's loud, but so common that it becomes background noise. 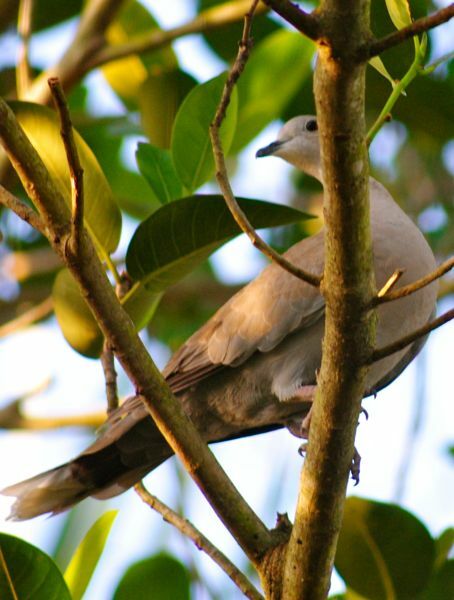 Mourning doves are somewhat similar to their cousin, the white-winged dove, except they lack the white bars on the wings, and its tail is pointed. It's a brownish bird, with black spots on its back, and white-tipped wings. It might seem like a plain bird, but a close-up of its face reveals an egg-blue eye ring that is quite pretty. The other noticeable feature is the head — it's small in proporation to the large body. Doves go about a foot head to tail, with a wingspan of about 18 inches. Mourning doves are ground foragers, making quick dashes for seeds. They'll find a field and literally gobble every seed they can and store it in compartment in their esophagus called a crop. They'll fly back to a safe spot where they can perch and digest their haul. According to Cornell, one crop was found to have 17,200 seeds in it. 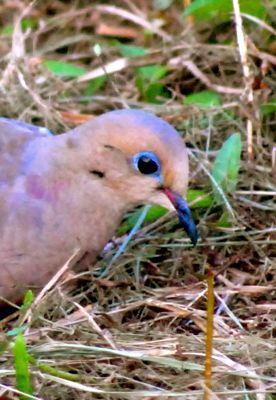 Hunting can take a toll on this bird in a second way — mourning doves will eat lead pellets as they forage and develop lead poisoning as a result. Mourning doves will gather sticks for a nest in trees, in brush, on the ground, or whatever happens to be handy. The female usually will lay two white eggs that will hatch in about two weeks. The young are nest-bound for two more weeks. Both parents handle egg-sitting duties, and both feed their offspring "pidgeon milk." The fledged doves will hang around for a week or two more to be fed by their parents. In Florida, a mating pair can have as many as five or six broods a season. This bird is ubiquitous. Look for it in towns, in fields, perched on electrical wires, in shrubs — just about anywhere except deep woods. It's a year-round resident of South Florida, as it is throughout the United States. Some mourning doves will spend the summer in Canada and winter in parts of Mexico and Central America, but by and large, this is not a migratory bird. The blue eye ring, seen in the photo on the left.